Decreasing our consumption of animal based foods would greatly improve our health and environment. I am always on the lookout for recipes that will help our family have a meatless night or two in our weekly menu. 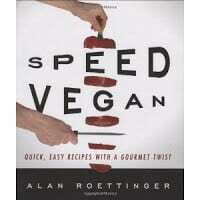 With this book, you can be a Speed Vegan and cook vegan food in a hurry! If you are looking for a vegan cookbook, definitely check this out! Be a Speed Vegan and Cook Vegan Food in a Hurry! Private chef extraordinaire, Alan Roettinger shares his kitchen wizardry in a collection of stunning dishes that anyone – even a newbie to the kitchen- can concoct in half an hour or less. Alan’s gift for pairing combinations of textures and flavors to create food that thrills and delights the palate runs rampant throughout the book. Alan Roettinger has been a private chef for a broad spectrum of high profile clients, from entertainers to presidents. A world traveler, he absorbed elements from many cuisines to syntheseize a unique, creative, personal style. Alan’s first cookbook, Omeg-3 cuisine, showcases his ability to bring health and flavor together, offering a wide range of dishes that are simultaneously exotic and accessible to the home cook. For more information visit www.alanroettinger.com. While I am not a vegan, I firmly believe that the American public is far too dependent on animal products in their cooking. Decreasing our consumption of animal based foods would greatly improve our health and environment. I am always on the lookout for recipes that will help our family have a meatless night or two in our weekly menu. The Speed Vegan is a wonderful reference whether you are strictly vegan or you just want to add some variety into your diet. The book starts out with a very helpful chapter on essential kitchen equipment and another on stocking the pantry. The equipment is listed as either necessary, helpful, or fun to have. I disagree with the author on one thing…my food processor is a necessity and not just merely helpful! I can’t imagine life in the kitchen without it! The selection of ingredients recommended for the pantry is long but includes everything from scallions, tofu and garlic to the more unique like dried mushrooms, edamame, and miso. These ingredients are the basis for some truly amazing recipes. I am usually put off my recipes that contain odd things that I have never heard of but the author does a wonderful job of taking a common recipes and making them unique. For example the Potato Salad with Salsa Verde and Chocolate Pots de Creme using coconut milk. There are a number of more unusual recipes as well, for example Lotus Root Soba Noodles with Tekka and Hominy Hash. But for the most part, the recipes looked like something I have seen before…with a twist! The other great thing about these recipes is that they are all made in 30 minutes or less. This is a great help when you are running around trying to get kids to after school activities, finish the laundry, and help with homework. Especially if you are raising them in a home with a natural vegan kitchen. I must admit, I like my cookbooks to come with lots of pictures and while there are several I could have used a few more. It is especially helpful to have pictures when you aren’t quite sure what it is you are making! But, I still give this book a huge recommendation for it’s unique yet familiar recipes and detailed information on preparing the vegan pantry! I am following you from Pitch It To Me Friend and Follow. Sounds like a great book. Vegan recipes are often hard to come by. Why does everything have cheese in it! I would love to check out Vegan Bites from the same publisher. Looks great! Would love to win this! I'm a vegetarian, not a vegan, but love vegan fare! I agree with the person above me: vegan bites looks great! I am addicted to cookbooks- I can't get enough, I'd love to win! I'd also love to check out Coconut Oil for HEalth and Beauty!